The specialty practice only had to expand support staff by 20 percent to keep pace. 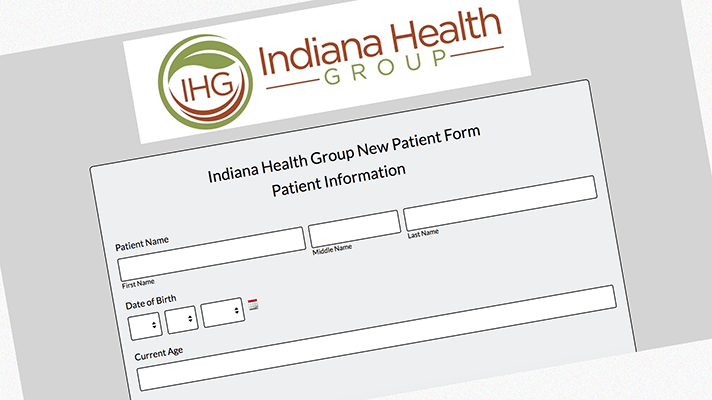 Indiana Health Group was experiencing a problem common among specialty group practices like it: finding ways to efficiently and accurately capture initial information from patients, such as demographics, insurance, past medical history, referral information and more. This is typically a laborious, paper-based set of processes, involving a variety of different staff members across multiple patient contacts by phone, e-mail and in the office. As any patient can attest, it's a highly inefficient system. "While we have enjoyed a fantastic relationship with our electronic health record company, iSalus Healthcare, there were a number of processes that we needed to address that at the time were beyond the scope of what was being offered by most electronic health record vendors," said Indiana Health Group President Chris Bojrab, MD. "We were looking for solutions that were more fully customizable and could be more readily adopted into our workflow." ""We were looking for solutions that were more fully customizable and could be more readily adopted into our workflow." So IHG explored using Google business tools and Google forms, documents and sheets, but they lacked some ability to customize and individualize data collection efforts. The practice also considered having the company that maintains its website create PDF-based forms for these purposes, but again, this lacked the fluidity that IHG desired in terms of collecting information and, more importantly, routing specific pieces of information to the appropriate parties within the practice. The practice then turned to an electronic forms processing technology from vendor Formsite. But while it initially was happy with the technology, it eventually switched to similar technology from another vendor, Formstack. Despite the fact that physician Bojrab had no formal training in this area, he designed and created most of the practice's forms using the platform's form editors, and online training resources for what he said were rare times when something wasn't immediately obvious. "Some of our support staff and administrative personnel have also created forms over time as we attempt to continue to tweak these for maximum efficiency," he said. "I love the fact that we have the ability to direct notifications to specific people or groups based on their roles. This feature is very handy as we have used this as a patient communication portal both to clinicians as well as administration." Similar to many practices, Indiana Health Group is extremely busy and sensitive to not overburdening clinicians or staff with information or communications that do not require their attention. The electronic forms platform helps it ensure that the right information quickly gets to the right people to address patient concerns without redundancies or the diffusion of responsibility, Bojrab added. Ninety percent of patients now opt to register online with the electronic registration system for onboarding. That is considerable considering IHG is the largest behavioral healthcare private practice in the state and among the 25 largest in the country. Its caregivers see between 75,000 and 80,000 patient visits each year including more than 6,000 new patients each year. "We have a clinical staff of 56 including physicians, psychologists, advanced practice nurses, physician assistants and clinical social workers," Bojrab said. "Despite that patient volume, we manage this with a staff of approximately 13 FTEs including administrators, medical assistants, as well as front and back office staff." Over the past decade, the group practice's clinical staff and patient volume has more than doubled yet its support staff has only increased by 20 percent. The use of information technologies such as the electronic forms processing platform is largely responsible for this increasingly efficient use of staff resources and the resulting improvements in patient care as well as the financial bottom line, Bojrab said.